“Enraptured, and enraptured, in broad daylight, dreaming…”- Marina Tsvetaeva, from ‘Selected Poems’. I apologise for my absence on this space. Something I, often say. And deeply feel. The fact is, another project has been consuming my all. Devouring. A word I’m all-too intimately familiar with. I can’t wait to share the details soon. It’s big. But, for now, there’s cake. 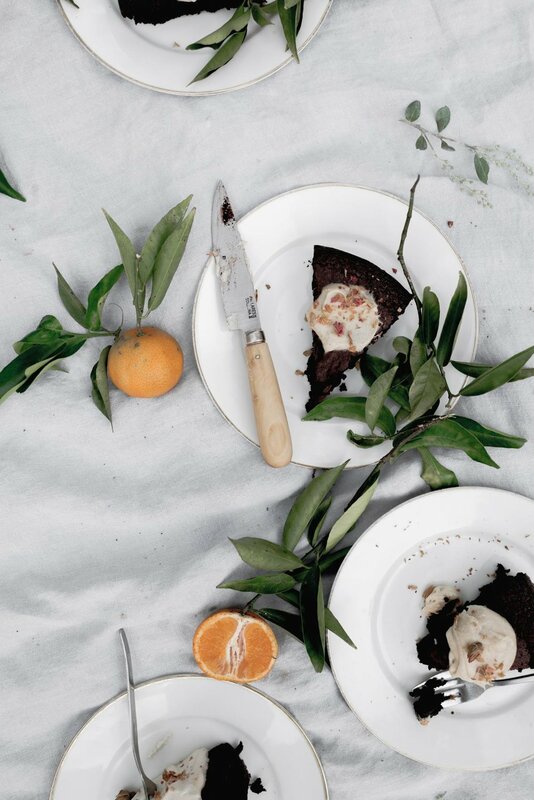 A Flourless Chocolate Olive Oil Cake with Citrus Coffee Cream. And a picnic in celebration of The World Fairtrade Challenge too. I have days of darkness and desire. Nothing more, thence my own wildness. Mornings, where the almond-blossoms fall and fade. Withering to elemental whim. Nights, where the melody in my head lulls. Though, never does the trill swan song truly stop. It’s always been this way. A soul, tethering upon a precipice, possessed by both an addiction for beauty and peril. Smouldering with passionate intensity. The kind of passion that explodes into the atmos, weeping, flowering and loving into a thousand fragmentations of dark matter. Her. With all the metaphysical mysticism mixed with cosmic pain. Loving, lusting, things into creation. The light, the dark, the breathing, the sighing, the shadow, the alter. The point of passion being the hilt of white. I, blessed with a deep wound for something, someone, to fill this life with romanticism and numbness, desires the most brilliant of loves and lives.And this cake. 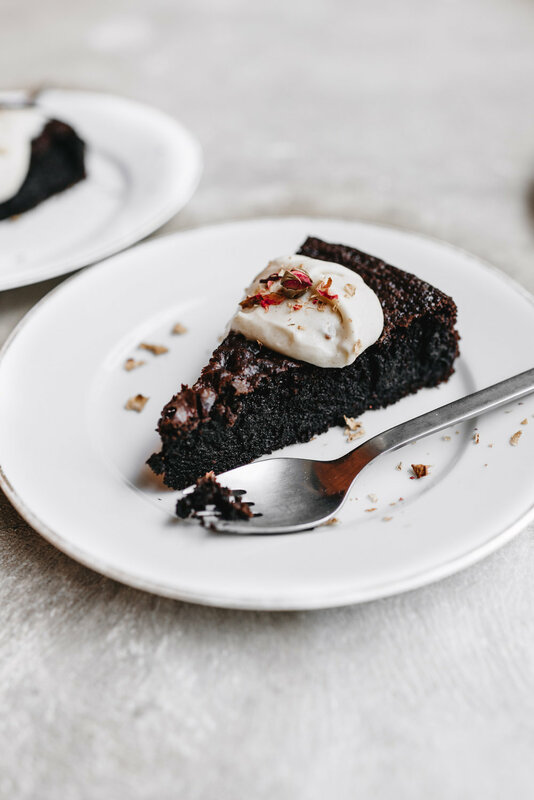 A Flourless Chocolate Olive Oil Cake with Citrus Coffee Cream created for my friends at Fairtradein honour of The World Fairtrade Challenge, a celebration of sustainable farming and trade. It’s the cake of dreams, of laughter and tears. Rich, from the intense flavour of dark chocolate. Bitter, from the bite of bodied olive oil. Slight salt, from fleur de sel. Smooth, like you wouldn’t believe. Decadent, always. The cake is topped with an incredibly delicious whipped Citrus Coffee Cream. And pastel-hued rose petals too, for I, have always been blessed with the need to adorn blossoms over everything I touch. It’s a one-bowl wonder cake. Forget the layered, forget the finicky, forget the painstaking hours-of-work…the humble one-layer cake, is my new favourite kind. I have always tried to live by the notion of sourcing ethical, sustainable produce. Coffee beans originating locally, or from a small-scale run farm. Vanilla beans imported from Madagascar. Dark chocolate, the closer connection to the pod, the better. A principle so intertwined with the foundation of Fairtrade. Fairtrade, connects products with global markets to make trade fairer and more ethical. Trade that’s fundamental for the lives of thriving farmer communities and impacts upon the sustainable evolution of those workers that play a vital role in bringing food to our shelves and table. Giving those, in developing countries, fairer working conditions, control over their futures and the ability to protect the environment. The work Fairtrade advocates for, is unparalleled. So, that’s what makes The World Fairtrade Challenge, so important. It’s celebration. It’s awareness. It’s coming together to unite in a common cause. It’s an opportunity for us all to connect with the people that grow the produce, we all depend on. And choosing to use products with the Fairtrade Mark as means for supporting small-scale farmer organisations that meet sustainable standards. It’s a topic I’m passionate about. I’ve always felt like the world has lost touch with where food comes from. How it gets from farm-to-plate. It’s about consuming less, buying better, becoming educated in more. Living. And, living well. Bake a cake. Any cake. Host a celebration in honour of The World Fairtrade Challenge (details below). And just enjoy. Pre-heat the oven to 180 c (350 f). Grease and line an 18-cm (7”) cake pan. Set aside. Place the instant coffee granules and the boiling water into a medium sized pouring jug. Stir until the coffee is dissolved. Set aside to cool slightly. In a large sized mixing bowl, combine the granulated sugar and olive oil. Whisk until just combined. Add in the eggs, one at a time, whisking well to combine after each addition. Whisk in the melted dark chocolate and vanilla bean extract, until the mixture is smooth and glossy. Set the bowl aside. In a separate large sized mixing bowl, whisk together the hazelnut meal, dutch processed cocoa powder, baking soda and salt, until well combined. Add half of the dry ingredients into the bowl with the olive oil mixture. Whisk until just combined, then, add in the remaining half of the dry ingredients. Whisk until smooth. Pour in the brewed coffee and whisk until the batter is smooth, evenly incorporated and glossy. Pour the batter into the prepared cake pan. Bake, for 35 to 40 minutes, or until the edges of the cake are firm and the top has just set. A cake skewer inserted into the middle should not come out clean but with a few moist crumbs attached to it. Remove from the oven and let the cake cool in its tin for 15 minutes. Then, carefully turn it out and onto a wire rack to cool completely. Slice and serve with a generous spoonful of the Citrus Coffee Cream and a sprinkling of rose petals, if desired. In the bowl of a stand mixer fitted with the whisk attachment, or using a handheld electric whisk, whisk the cream on medium speed, until soft peaks are just beginning to form. Pause mixing and add in the brewed espresso, ground cardamom and orange zest. Resume mixing and whisk until the cream is just beginning to reach firm peaks, about 1 minute more. Place the bowl in the refrigerator to chill the cream before serving. Thank you to my friends at Fairtrade for sponsoring this post. As always, all opinions are my own. The World Fairtrade Challenge is back! 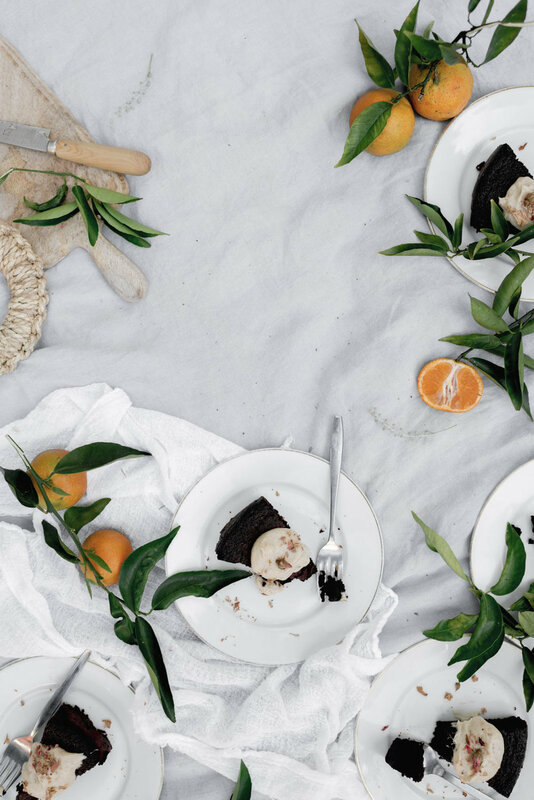 From May 12th to the 14th, you’re invited to join this global celebration of all things Fairtrade, with people around the world hosting events at home, at work, or in the community. Signing up is easy. Register your celebration here! Make sure to use the hashtag #FairtradeChallenge too! And enter the giveaway competition to win delicious Fairtrade goodies. Will you join the celebration?